W&R584 / Cha454 Come Celebrate the Call of God (Wren) Good words to a lilting intuitive tune. 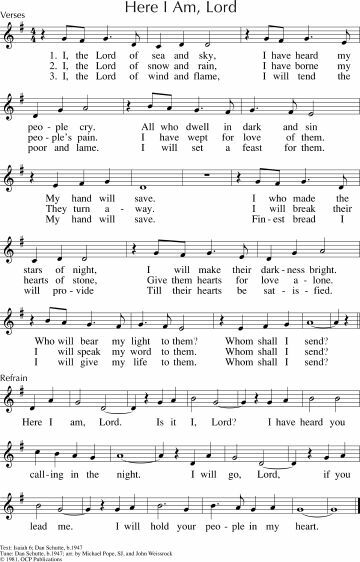 This song is written to recognise a commissioning or the gift of a particular person's call. Lyrics and sheet music sample. NCH355 / UMH648 / VU514 / PH523 / W&R149 / Cha450 God the Spirit guide and guardian (Daw) Suitable for Ordination or Commissioning. Excellent, inclusive Trinitarian lyrics of God's guidance and blessing on leaders in the church community. Set to a variety of well known hymn tunes including HYFRYDOL (my favourite!). Lyrics and funny sound sample. NCH356 God who summons through all ages (Downing) An ordination song. Includes men and women - a very personalised hymn for ministry and for an individual. NCH357 / CH680 / G(II)487 / GC680 / GC(II)675 You are called to tell the story (Duck / ROSEMARY / REGENT SQUARE) This ordination-specific song can be sung to a range of tunes. It is a song from the congregation to the ordinand. CH677 / AA069 / CP299 / SP159 In the name of Christ we gather (Murray) Quite formal words for an ordination of a Minister of the Word. Lyrics and tune sample. MV161 I have called you by your name (Damon) Commitment, confirmation, ordination, commissionings, but also ordinary Sundays. Easy, natural tune and good words about having courage to follow where God leads. ATFG589 / NCYC'99 / VU298 When you Walk From here (Good) A simple benediction, that would be appropriate for a commissioning. MV211 Go now in peace guided by the light (Rubalcava) Lovely English / Spanish benediction or comissioning prayer with an excellent rhythm. "Go now in peace guided by hte light of Christ, so you may be nourished by the Word of Life". *MV 202 Bread for the Journey / Pain pour la route (Harding) A simple chant for the distribution of communion; would work well for a group of people being commisioned to go out and do something who are celebrating communion before they go. CH175 / GtG628 Praise I will praise you Lord with all my heart / Je Louerai L’éternel (Fraysse) Good words; tune is a little schmaltzy, but easy to sing once heard. Excellent words of serving God in the years to come. *Online Resource Be a blessing (Bruxvoort-Colligan) A song of encouragement based on this Psalm. This would be a wonderful song to sing at someone's commissioning, or as a benediction song to your congregation. It would be tricky for a congregation at first, so I would get your musicians to present it as a gift to the congregation. Lyrics, sound sample and sheet music. *TiS 658 / AoV1-090 / ATE 296 / CH251 / UMH593 / VU509 / WoV752 / ELW574 / HPP541 / HPSS525 / G(II)492 / GC(II)671 / CP(E) 470 / W&R559 / Cha452 / Srce328 I the Lord of sea and sky / Here I am Lord (Schutte). Song of God searching for us and our response. Good for any sort of commissioning! Very slow sound sample. Lyrics and sample sheet music. NCH359 O God who teaches us to live (Hunter) A song for the commissioning of Sunday School and School Teachers! TiS 190 / NCH030 / HPP296 / W&R643 / Cha457 Colorful Creator God of mystery (Duck) Good words, I think this would be a good song to recognise the life of a painter, a musician, a poet, actor or writer. Excellent tune with nice twist at the end.